If you've logged into your commenting account today with your username and password, you may have been prompted to convert your account to third-party authentication, using either Twitter, Facebook, or Google. Why are you doing this? We're making this change for security purposes — namely to enhance your security as a user on our sites. By tying your commenting account to a Twitter, Facebook, or Google account, we're putting our account security layer in the hands of some of the best in the business — major sites with more security expertise and resources than anyone else on the web. I already log in using my Facebook or Twitter accounts. Do I still need to convert? Not necessarily. You only need to convert your account if you currently log into our sites with a username and password. If you were already logging in via Twitter or Facebook, you're gold. The conversion process is pretty simple. If your account needs converted, you should be prompted to do so when you login, or you will see a message prompting you to do so in the notification drop-down at the top right of the page, then simply follow the prompts to transition your account to whatever service you prefer. Does converting mean I'll lose my "identity"? Nope. The same username will display on all your comments, and all of your comments and history will carry over. Basically, things are exactly the same as before; you just log in using a different method. Will people be able to see my Twitter/Facebook/Google account on this site? No. The only thing visible to other users will be the screen name you set on our site and any other information you explicitly add to your profile. You may log in via Twitter/Facebook/Google, but no one on the site will know what your Twitter/Facebook/Google account is unless you add this information to your profile. Some of you may prefer not to tie your commenting account to one of your IRL accounts. If anonymity is a concern, we suggest you use an anonymous account from one of these services. You're using my info for ad targeting, aren't you, scumbags? No. Promise. It's just for log-in purposes. 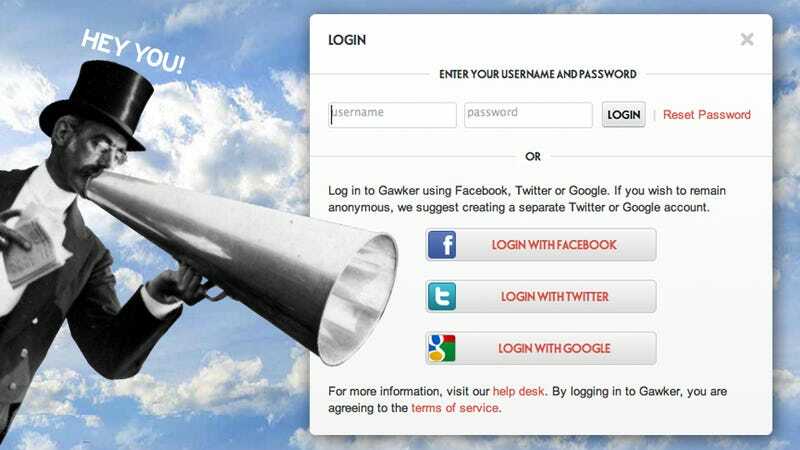 We want to make this process as painless as possible, so if you have any trouble, concerns, or complaints, please take a look our FAQ and feel free to email help@gawker.com with any other questions.